Ashley the 11-month-old Pit Bull mix lives in the firehouse on Pitt Street. Meet the only four-legged member of the Lower East Side's Fort Pitt firehouse. 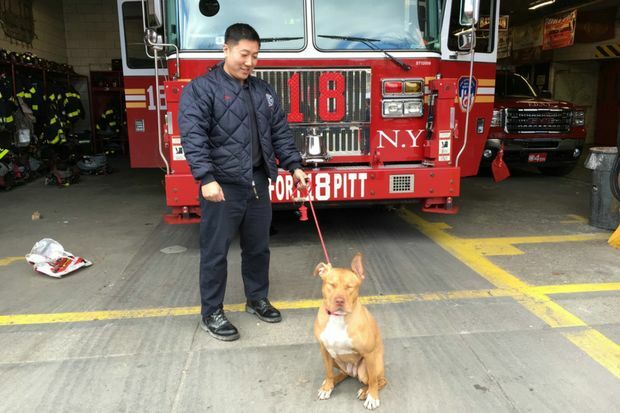 Ashley, an 11-month-old pit bull mix, has stolen the hearts of firefighters at Engine 15/Ladder 18/Battalion 4, where she gets plenty of love when she's not riding along in the fire truck with her many companions, they said. "She gets like 20 walks a day and an unlimited amount of snacks," said firefighter Johnny Ho, adding that everyone in the firehouse at 25 Pitt St. chips in to care for the pup. Ashley is a rescue dog originally from Staten Island, Ho said. The firehouse adopted her when she was just 2 months old. She was worse for wear when they first found her as a pup — she was recovered from a "crack house" in Staten Island — and was nervous when she was first brought to her new home in Manhattan. But now she's made a family at the "Fort Pitt" station, enjoying rides around in the fire truck, as long as the mission isn't too dangerous, Ho said. "We take her out for small, minor stuff," he said. When she isn't working, Ashley enjoys eating, sleeping, and playing fetch, Ho said. She's also gotten quite a following on Instagram, where firefighters share photos and videos of her hanging around the station, riding in the truck, and playing with her coworkers.